I am obsessed with making ice cream these days. Ice cream is a nice balance between baking and cooking–because it acts as a great canvas to play with- and you can be less precise than baking. That being said, my experiments, thus far, never turn out as well as the recipes. For all recipes- basic and inventive- I turn to David Lebovitz. I am super into his book The Perfect Scoop. 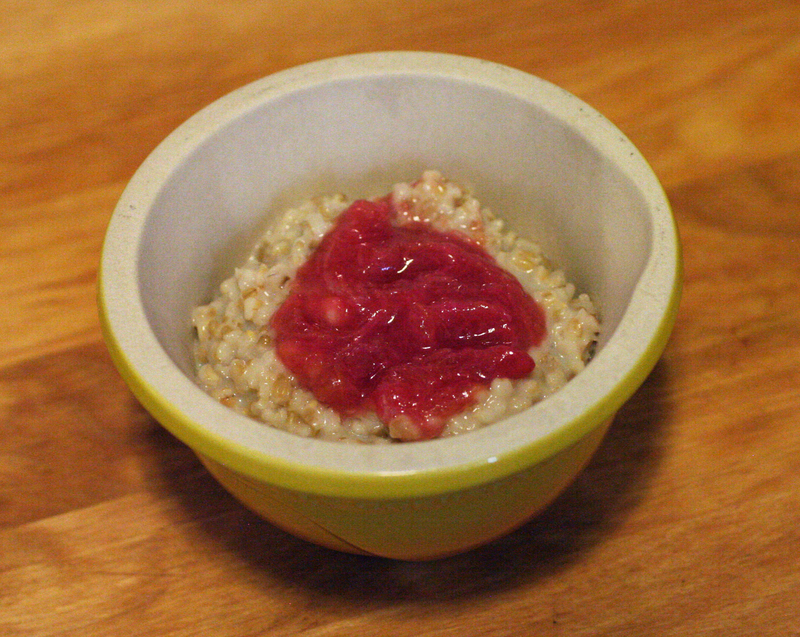 David posts several of the recipes on his blog– so check there. Also- if you have anything else in mind- email me. 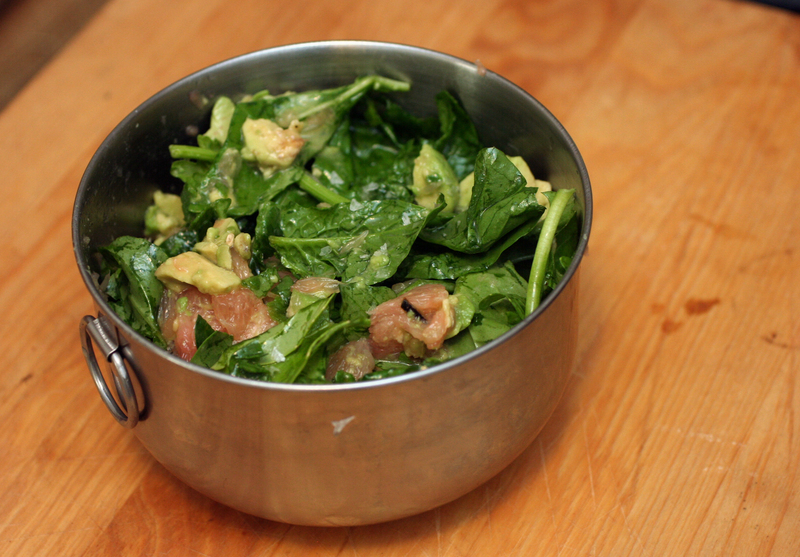 But here are two non-David Lebovitz recipes that I want to make again and again. David, fyi, also has a method for non ice cream maker ice cream- never tried- but just a bit more labor intensive. Also, a fundamental question often asked. Ice Cream generally has Milk and heavy cream. Sherbet only has milk. Sorbet has water. I have been playing around a lot with yogurt too– which tends to retain the tang (for better or worse) not always in commercial fro yo. For me, Sherbet is a favorite– because it tastes creamy, but I feel a little less bad about it than when I know I have consumed cups of heavy cream. ech. David Lebovitz- has a Chocolate Sherbet recipe- that is dynamite! Oh and while you are on his blog- check out the recipe for Whole Lemon Bars. I didn’t even know I liked lemon bars before those. 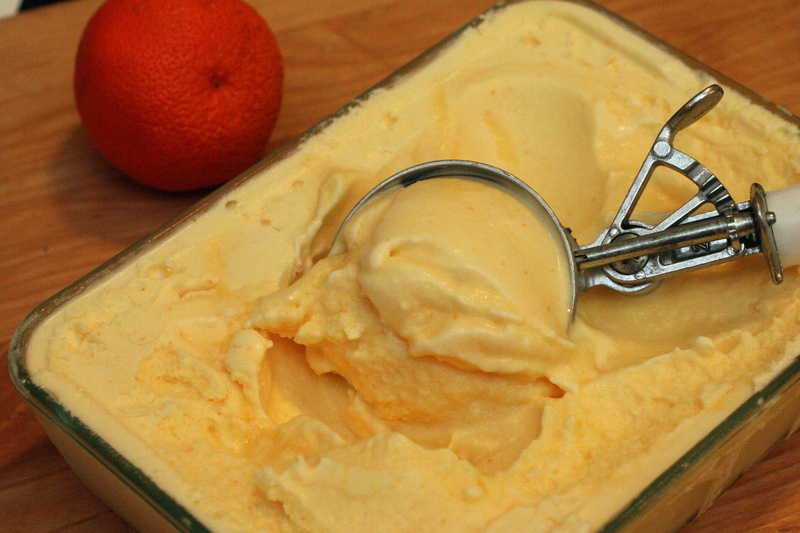 Fresh Orange Sherbet- America’s Test Kitchen Recipe. 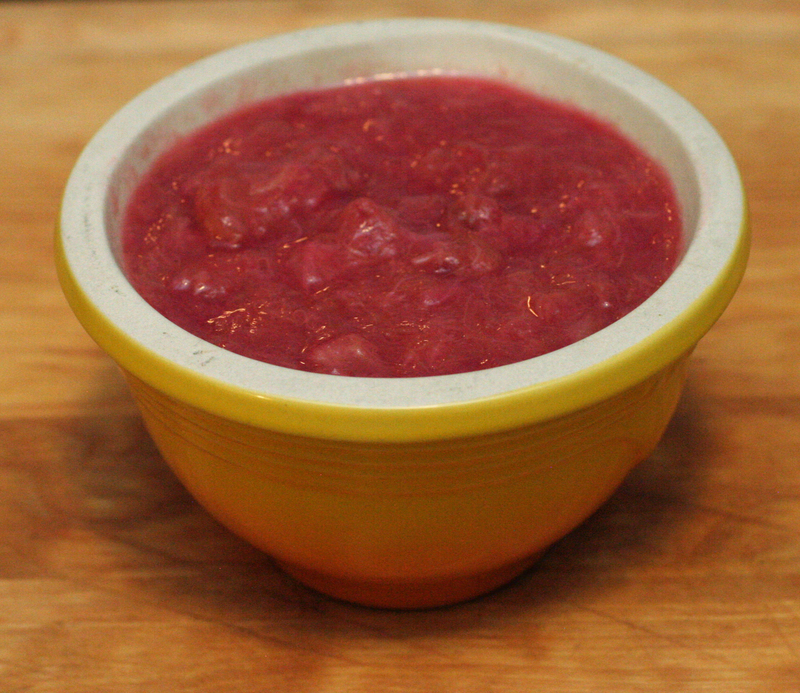 This recipe- nothing like the old-school gross Sherbet you might associate with fruit punch. This tastes like creamsicles. 1. Process the zest, sugar and salt in the food processor until damp, 10 to 15 one-second pulses. With machine running, add the orange and lemon juice in slow stream, continue to process until sugar is dissolved, about a minute. Strain through fine-mesh strainer- into a medium bowl. Stir in triple sec, cover w. plastic wrap and chill in the freezer until very cold, 30 to 60 minutes. Don’t let it freeze. 2. When it is cold, whisk heavy cream until soft peaks. whisking constantly, and juice slowly in, pouring against the edge of the bowl. Immediately start ice cream maching and add to canister. freeze to machine’s instructions. 1. 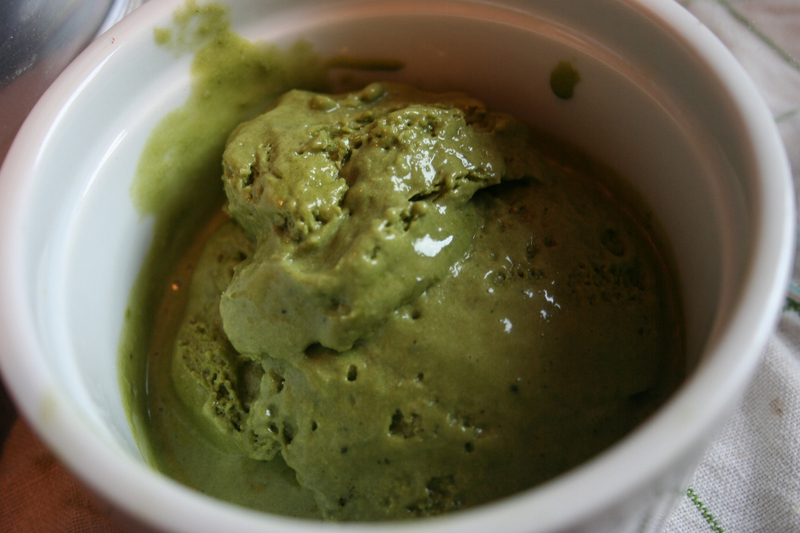 In a small bowl, mix the green tea powder with 2 tablespoons granulated sugar. 3. Pour milk into a small pan and gently heat taking care not to let it boil (ideally the temp of the milk should be 176F). Remove from heat and mix a few spoonfuls of the warm milk with the green tea powder and sugar in a small bowl. When you have a smooth paste, add it to the remaining milk in the pan, then gradually combine with the egg yolk mixture. Leave to cool (in fridge). 4. light whip the cream and then add to the cold green tea mixture. 5. Add to ice cream maker and freeze per instructions. 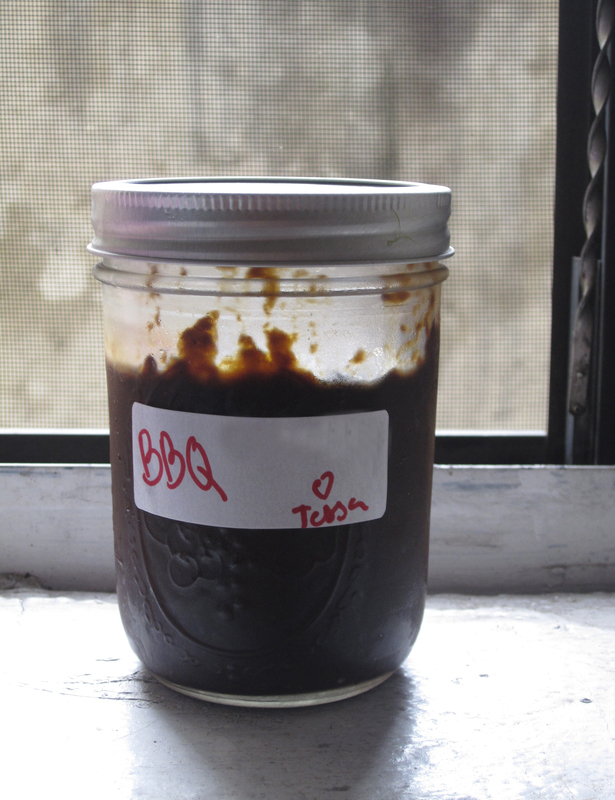 Believe me when I tell you that homemade bbq sauce is worth the effort. I take that back, it is not so much effort as a list of ingredients you might have to buy. I remember buying them all the first time I made it– and it seeming absurd to spend so much more on ingredients than just buying a bottle of sauce.But it turned out so damn good- and they all super useful things to have around- and I have made this recipe again and again. Makes a nice summer time bbq gift. The sauce is an America’s Test Kitchen Recipe. It is both sweet and spicy. Pare down on cayenne if you don’t like heat. Process onion with the water in a food processor, until it looks like slush. Put in a fine mesh strainer and push down with a rubber spatula, reserving 1/2 cup of onion liquid. Discard solids. Whisk onion juice, ketchup, molasses, syrup, mustard, hot sauce, black pepper and liquid smoke (if using) in a medium bowl. In a large saucepan over medium heat, heat oil until shimmering but not smoking. Add garlic, chili powder and cayenne; cook until fragrant, about 30 seconds. Whisk in ketchup mixture and bring to a boil. Reduce heat to med-low and simmer gently, uncovered until flavors meld and sauce is thickened, about 25 mins. Cool bbq sauce to room temperature before using- (you will notice it thickens quite a bit more as it cools). 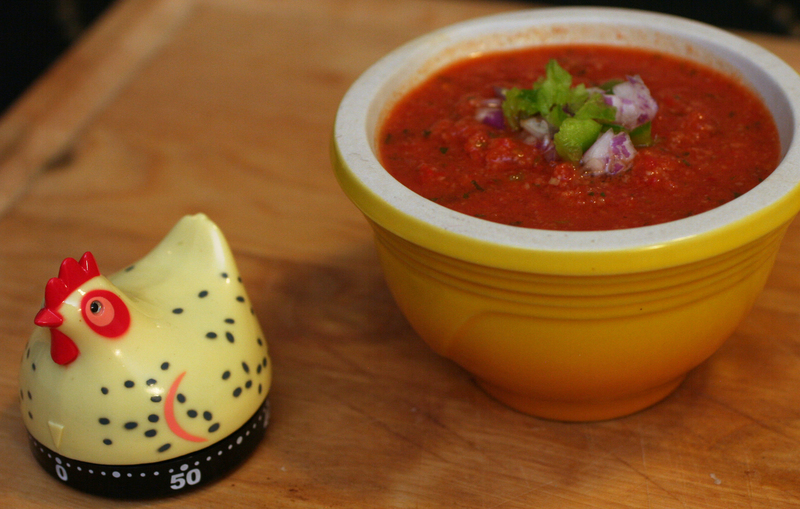 Sauce can be refrigerated in an airtight container up to 1 week. I took 2 chicken breasts (bone in, skin on) and smothered in about 1/3 of the sauce. Left in a covered tupperware overnight (I am sure a couple hours would have worked fine). The next day, set the oven to 350. Line baking sheet with foil. Put chicken on the sheet and top with sauce collected on bottom of tupperware. Baked for 35 mins or until juices run clear… and temperature (if using a thermometer reads 150 or above). Can brush with extra bbq sauce the last 2 minutes before chicken is done cooking. Also can serve with extra sauce.